Port Logan, or Portnessock as it was originally named, is a small village in the South Rhins of Galloway. The origins of the 'current' village, date back to the 17th Century, when the local laird built a pier and cottages around the shoreline. However, it is almost certain that there has been some kind of settlement in the area dating back to Neolithic times, and artefacts have been found on the Mull of Galloway which would evidence the presence of our early ancestors in the area. The mild climate, proximity of the bay to fishing grounds and fields for pasture and cultivation would make it an attractive place for subsistence cultures to live. Later, the Bay must have been visited or even settled by Vikings, as the name 'Portnessock' means, 'bay of the nose'. In the mid seventeenth century, the harbour prospered and was reckoned to be superior to Portpatrick, enjoying good trade in particular with Ireland and the import of cattle (and people)! However, by the beginning of the eighteenth century, the village was a miserable sight, according to contemporary accounts, with a single straggling row of low built cottages beside a rough track leading to a ruinous pier. 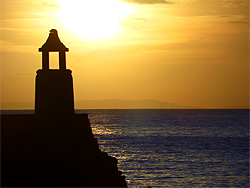 Improvements to the village were begun in 1818 by Colonel Andrew MacDowall (Douall), the laird of Logan, who erected a new quay and bell tower from a design by Thomas Telford. The distinctive tower was built from granite and sandstone and would have been used to guide boats into the harbour in poor weather. The Laird had grand ambitions for the harbour and renamed the village Port Logan. A proposed breakwater across the bay would have provided protection from North Westerly winds, and would have enabled larger vessels to berth in safety, but it was was never built, which limited development of Port Logan as a harbour. The Laird also built a grand three storey house at one end of the village and planned to build more, to create an impressive facade. His ultimate aim was for existing cottage dwellers to move up to new houses on the top row, however, most were unwilling to leave, much to the frustration of the Laird, even though his new embankment with the road on top effectively blocked the cottagers view of the bay! Undeterred, the occupants took advantage of the new shelter the embankment offered, and those that could afford to, built another storey to their property. Disillusioned with the stubborn cottage dwellers, or more likely, when the harbour at Portpatrick was improved and superseded Port Logan, MacDowall let the harbour fall into disrepair, though the tower and quay remain remarkably well preserved, considering the battering from the winds and seas they have endured over the last 200 years or so. The other building of note in the village, is the former lifeboat station, opened in 1866 and closed in 1932. 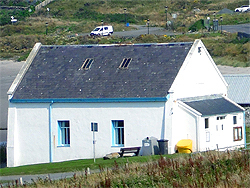 The hall is now the Community Village Hall and is used for a range of village activities, and can be hired for events. 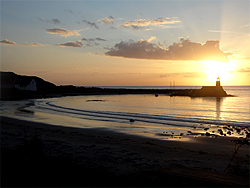 Port Logan was briefly in the pubic eye again in 2000 when filming of the first series of the BBC drama 'Two Thousand Acres Of Sky' began. The complete series was aired on BBC Television from 2001 to 2003. 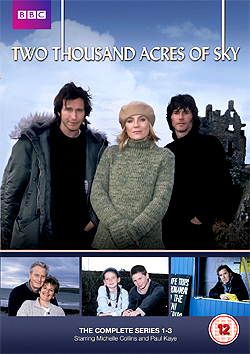 Written by Timothy Prager and starting Michelle Collins and Paul Kaye, it tells the story of how Abby, a single Mum from London moves to the fictional island of Ronansay off the coast of Skye in Scotland, with her two children and friend, Kenny, who poses as her husband. It follows them as they try to make a new lives for themselves, the drama focusing on the relationship between Abby and Kenny and the villagers. The series has a great cast including Elaine C. Smith, best known as Rab C Nesbitt's wife and Michael Carter who played Bib Fortuna in Return of the Jedi! Many locals starred as extras and the village features prominently. At the time, it made a huge impact on village life, as roads were closed for filming, and even the caravans at Muldaddie Farm were banished. www.bbc.co.uk/drama/sky (WARNING - SPOILER ALERT! - don't visit this page if you plan to watch the series)! 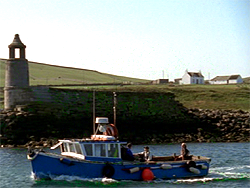 Here's a still taken from the first episode of series one showing the bell tower with Muldaddie farm in the background. The complete series (1, 2 and 3) of 22 episodes is now available to purchase on DVD from Amazon, and also on Sky for subscribers. In times gone by there was a local rhyme that poked fun at the residents of Portnessock. For 'Bonnie place' substitute 'dirty hole', and 'paiky-dogs' are dog fish, that were generally considered inedible, but standard fare in Portnessock apparently! Today Port Logan is unspoilt, beautiful and tranquil, remaining pretty much as it was at the end of the 19th Century (though thankfully, dog fish are no longer the staple diet)! Some amazing old photos of Port Logan are here on YouTube. You can also listen to a presentation by James Stewart in 1992 to the local Women's Rural Institute on the history of Port Logan Hall. Many thanks to Edward Beck for uploading all three of these to YouTube.